Naming a business is one of the most important things owners do to get a message across. 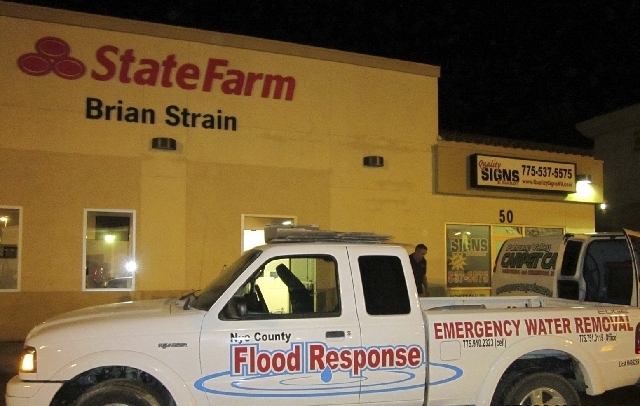 It tells potential customers what services are offered, and in the case of Nye County Flood Response, it tells people where those services are offered. Owner Trevor Maxwell, 38, said he thought the name was great until the public associated his business with the county’s services and his phone began to ring. Maxwell said his business has been open about two years — right around the time when Pahrump experienced its last torrential rains in 2010. Not wanting to be misinterpreted, Maxwell said he’s considered changing the name of his business. “I either change it or learn to work with it,” he said. He said normally, the only water shut-off is located in the water box at the street for those on public utilities, or at the well for those with their own water supply. Maxwell said, “People don’t think right in times of emergency. They either don’t know or can’t figure out how to turn off the water.” He said most of his calls come in the middle of the night. Maxwell’s equipment includes high-powered wet vacuums, “air scrubbers” and huge fans. He said most of the time the padding is discarded and the carpet dried. Another hazard is cold weather and construction built on a slab. He said most of the utilities for those types of properties run through the ceiling. “When the temperatures got down below freezing this past winter, a lot of damage was caused by pipes freezing in the ceiling. He said once he gets the water turned off, removes wet carpet and gets the padding out, he removes as much water as possible before putting the air-moving equipment to work. Most of his work is paid for by homeowner’s insurance and he said he doesn’t charge any overages. Maxwell said it’s his job to “be there” for the public and he is seriously considering stockpiling filled sandbags he can deliver to residents trying to keep water from entering their homes. “My son and I were discussing that just this morning,” Maxwell said. “I’m looking at having sandbags as a part of being there for the community.